President Obama has made a surprise visit to Bagram Air Base in Afghanistan in the midst of a worsening jobs picture and a fight over extending the Bush tax cutsat home. His high-security visit to the embattled and dangerous country, which following a secret overnight flight, was kept quiet until now under White House rules. 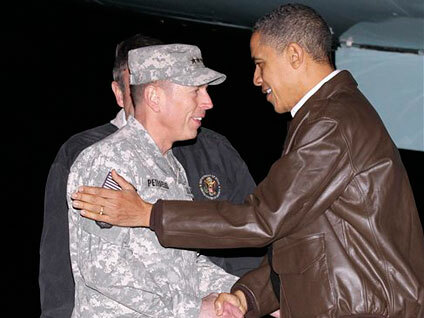 It is his second trip to Afghanistan as commander in chief. He was greeted by top Afghan commander Gen. David Petreaus and U.S. ambassador to Afghanistan Karl Eikenberry as he stepped off Air Force One. The trip comes amid a review of the conflict, which is now in its ninth year. The review is not expected to result in a change in the U.S. strategy in the war despite a number of setbacks in 2010, among them revelations that the United States had been paying and negotiating for peace with a Taliban representative who is likely an impostor. There have been 467 American troops killed so far in Afghanistan this year, the highest number for any year in the conflict up to now. The White House has its eye on 2014 as a possible date to end combat operations and next summer as the beginning of the wind-down period. The president made the trip primarily to meet with and thank members of the military, according to the White House. He is scheduled to spend three hours at Bagram. After meeting with Petreaus and Eikenberry, he plans to visit with eight patients at a hospital on the base -- five soldiers and three civilian contractors. He will award five Purple Hearts during that visit, White House press secretary Robert Gibbs said. The president is also scheduled to make a speech to troops before his return to Washington. The trip comes in the wake of the release of secret diplomatic cables that described out-of-control corruption and bribery in the country. The leaks, from the group WikiLeaks, described the country as "a looking-glass land where bribery, extortion and embezzlement are the norm and the honest official is a distinct outlier," as the New York Times reported Friday. The president will speak over secure videoteleconference with Afghan President Karzai from Bagram. A planned face-to-face meeting at Karzai's palace in Kabul has been canceled because bad weather is keeping the president from traveling to the Afghan capitol. Gibbs said high winds and low visibility made the trip to Kabul "not an option." Deputy National Security Advisor for Strategic Communications Ben Rhodes told reporters planning for the trip began a month ago, and was designed in part to wish happy holidays to members of the military. He said this is a "particularly tough time of the year" for service-members and their families and that the president wanted to "underscore" the sacrifice they are making. "While it would have been nice to share a meal, I think President Karzai understood that the purpose of this was really for the President to spend time with the troops," Rhodes said. The audience for the president's speech will be largely made up of members of the 101st Airborne Division, which is on its 4th combat deployment. A rock band from the division played songs by Metallica, Blink 182, Oasis and other groups before the president was set to speak. Troops also sang a portion of "Rudolph the Red-Nosed Reindeer." Mr. Obama last visited Afghanistan in March, at which time he pressed Karzai on corruption in his administration. The two men met face-to-face less than two weeks ago at a NATO summit in Lisbon. Karzai has complained angrily in recent weeks about U.S. military tactics, specifically special operations raids designed to root out insurgents, amid heightened tensions between his administration and its U.S. counterpart. In the WikiLeaks cables, Karzai was described as an "erratic" leader who was "indecisive and unprepared" and a less-than-reliable partner. Roughly one year ago, Mr. Obama ordered an increase in U.S. troop levels in Afghanistan to about 100,000, tripling the U.S. presence in the country from when he took office.